The rituals conducted by the Telugu speaking people during the ceremonious occasion of wedding are different from those conducted in neighboring southern states of India. In Andhra Pradesh, the Telugu people follow their own traditions, while conducting a wedding. The bride's maternal uncle and her brother play a prominent role at the time of the her marriage. Apart from being an event that calls for religious observance, the traditional Telugu wedding consists of some fun moments as well. 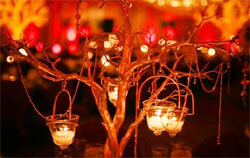 If you want to know more about the Telugu weddingrituals, then this article is what you need. 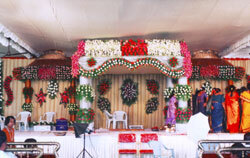 Here, we have provided comprehensive information on the ceremonies conducted during traditional Telugu marriage. As a part of Mangala Snaanam custom, the bride and groom are required to take an auspicious bath on the wedding day. The aim is to purify them and make them prepared to perform sacred rites. Oil is applied to the bride and groom at their respective houses. Thereafter, the family members get together to perform Aarti. They pray to Lord to give wisdom to the bride and groom to lead their life happily. Before the wedding ceremony, the groom attends the Ganesh pooja, which is conducted at the mandapam. Kanyadaan is the ceremony in which the girl's family hands over their daughter's responsibility to the groom. During the ceremony, the bride sits in a bamboo basket. Her maternal uncle brings her to the mandapam. Until the completion of the kanyadaan, the bride and the groom are not allowed to look at each other and therefore, they are separated by a curtain that is place between them, as a partition. Thereafter, the bride's parents wash the groom's feet, assuming him as an 'avatar' of God. The priest recites the shlokas from the Vedas. Thereafter, the couple is asked to smear a paste made from cumin seeds and jaggery on each other's hands. This custom is referred to as Jeelakarra-Bellamu. This ceremony is observed to communicate that the relationship of the married couple is unbreakable and inseparable. As a part of Madhuparkam ritual, the bride dresses up in white cotton sari with red border. On the other hand, the groom wears white dhoti with red border. White is the color for purity and red is for strength. Ten married women (sumangalis) accompany the bride. Six out of the ten women hold plates containing a mixture of rice and turmeric powder, while the rest of the four hold small lit lamps in their respective plates. Rice represents abundance, while the lit lamps symbolize light. In order to perform the ritual, the partition between the bride and the groom are removed. After removing the partition, the groom ties the two strings of the mangalsutra, each with a golden disc, around the groom's neck. The mangalsutra represents the physical, mental and spiritual union of the couple. 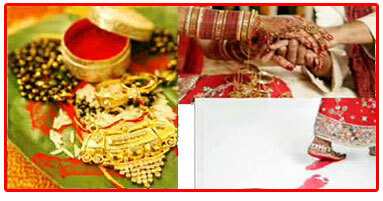 In the Telugu wedding, the groom ties three knots of mangalsutra. In the Kanya Daan Akshata ceremony, the bride and groom exchange garlands. People witnessing this occasion come forward to bless the couple, by sprinkling flower petals and rice coated with turmeric powder. As a part of the Saptapadi ritual, the groom and bride walk seven steps together around the fire, while chanting mantras. When the pheras are conducted, the pallu of bride's sari is tied to one end of the groom's dhoti. Sthaalipaakam is a ritual wherein the groom adorns the feet of the bride with silver toe rings. In order to ward-off the evil eye, she is asked to wear a string of black beads during the ceremony.